A woman creeps through the ductwork of a quiet home. A medical procedure reveals an object of worship. A carnivorous reptile divides and cauterizes a town. Amelia Gray's curio cabinet expands in Gutshot, where isolation and coupling are pushed to their dark and outrageous edges. A master of the macabre, Gray's work is not for the faint of heart or gut: lick at your own risk. “Strange, fable-like, and physical, Gray's stories are driven by uncanny forces and set in organic yet unnatural worlds . . . Masterly gathering of forces [are] at the heart of the collection: black humor brushes up against abject tragedy, desperation and abuse, longing loneliness, and even hopeful peace. Gray dazzlingly renders the wide array of human experience in these potent, haunting stories. “The minute details of life are memorably rendered in surreal and sometimes grotesque ways . 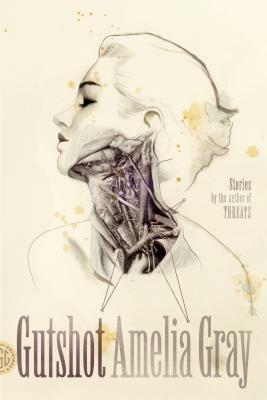 . . [Gray] takes familiar elements and pushes them toward an eerie, transgressive place . . . This is Gray's fourth book (and third story collection), and it features the widest stylistic range of any of her books to date. . . Grim, bittersweet . . . comic . . . and emotionally harrowing. The best of Gray's stories find that balance between devastation and humor and navigate an uneasy territory with agility.